This verbatim theatre piece is based on personal stories from ex-provisional I.R.A. volunteers and victims of violence. It is very much about the individual and delicate stories behind the troubles. The immediate power of the theatre is an ideal vehicle to use for these purposes. Stories and the act of dramatic story telling enables us to create and foster tolerance and insight from experience and they will have the power to help shape our relationships and understandings. What is more, to document such experiences prevents history from being lost, rewritten or misrepresented. It opens the possibility for a society to learn from its past. Dramatic storytelling and the archiving of such stories about the conflict and its impact are important. Their importance lies not just in being a testimony to, and affirmation of, our individual and collective experiences, but because it is through such a process we come to know others and ourselves. Dramatic storytelling can be an important part of healing including the opportunity for acknowledgement. The play transcends historical divisions and gives voice to those individuals and communities who have suffered as a result of the conflict. Verbatim Theatre acts as a form that gives voice to those who have been marginalised, forgotten or are invisible in society. Their true-life stories are shared onstage so that audiences can collectively bear witness to issues of suffering, redemption and social justice. The play recognises and appreciates the fact that diversity of opinion, belief, experience and community background exists. In fragile political contexts there is a tension between the desire to address the hurts of the past and to ignore them. Either way the line between risk and opportunity is a tenuous one. Sat 8th December 2012: Clones, Protestant Hall, Co. Monaghan. 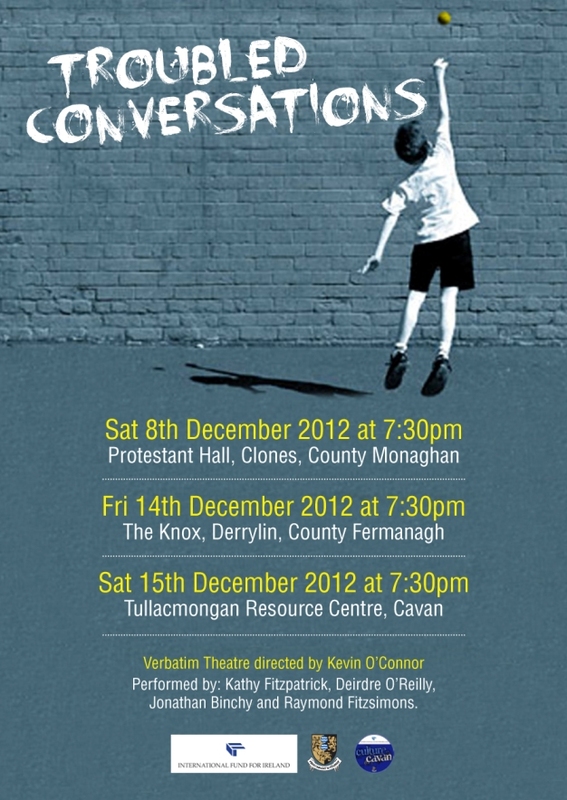 Fri 14th December 2012: The Knocks Community Centre, Co. Fermanagh. Sat 15th December 2012: Tullacmongan Resource Centre, Cavan, Co. Cavan. 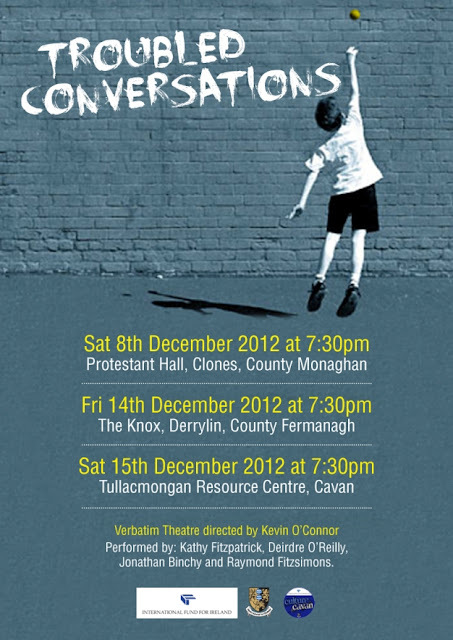 The show started at 7.30pm each night and was then followed by a facilitated discussion in Clones and Cavan.